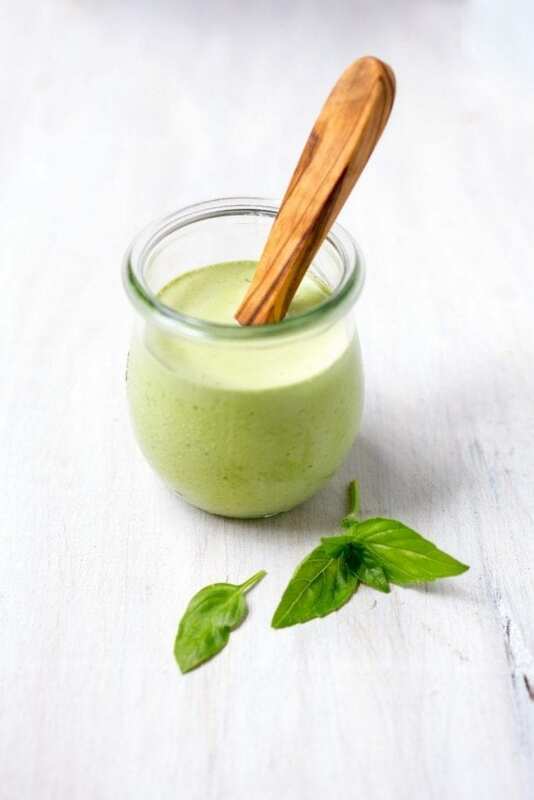 A creamy, herb-packed basil Green Goddess salad dressing that’s also light and refreshing. Our version uses basil in place of parsley, adding a sweet, summery note. While you can’t throw a carrot without hitting a bottle of ranch dressing these days (seriously, Americans are obsessed with the stuff), in the 1960s and 70s, Green Goddess was king. Or Queen, I should say. Invented in California and named after its distinctive color, the original version was a mix of tarragon, parsley, chives and scallions. It really took off in the 60s, the era of wedge iceberg salads and cream cheese stuffed celery sticks. Eventually, as trends always do (sorry kale, your time is almost up), it fell out of favor. I can’t even remember the last time I’ve seen it on a menu. And that’s a real shame because when made well, it’s absolutely delicious and so much better than ranch. While the original version uses tarragon, our garden is bursting with basil and I love the delicate sweetness it adds. Really you could add any soft, green herb you like. A mint version would be incredible on lamb burgers, a cilantro version on grilled shrimp and zucchini. You want a light oniony note so chives or scallions (preferably a mix) is key. Parsley is always a welcome addition. The only ‘rule’ is keep the herbs soft (for example rosemary would be too strong and woody here) and to preserve the beautiful color, keep them green (I’m growing purple basil but I didn’t use it here. It would turn the color murky). Don’t be afraid of the anchovy. It won’t taste fishy at all but adds a salty note that is the definition of ‘umami‘. You can use filets packed in oil or the paste that comes in a tube, but don’t skip it (unless you’re allergic, of course). We originally made Basil Green Goddess for our Fried Chicken Sandwiches, both to season the cabbage slaw that goes on top and to slather on the toasted buns but we’ve been enjoying the leftovers all week. We used it on a salad with gem lettuce and hard boiled eggs. We used it on the most delicious BLTs ever. We dipped cucumber spears into it for a snack. Don’t overdo it with the garlic. It can be pungent when raw so start with one small clove and add more to taste. Traditionally sour cream is used but I like the flavor of Greek yogurt even better. If you want it thicker to use as a dip, add half an avocado to the blender. The flavors need a chance to blend so it’s best to make it about 30 minutes before you plan to use it. The dressing will last in an airtight container in the refrigerator for up to 3 weeks. We doubled the Basil Green Goddess recipe to have enough for the sandwiches, slaw and leftovers. I recommend you do the same. A creamy, herb-packed salad dressing that's also light and refreshing. Our version uses basil in place of parsley, adding a sweet, summery note. Would fish sauce work as a substitute for anchovies or anchovy paste? Seems wasteful to buy a container of something I’ll only use a few times when I have a perfectly good half-full bottle of fish sauce in the pantry. I haven’t tried the substitution myself but I think it would work. They both have that umami flavor you want. Fish sauce tends to be saltier than anchovy so adjust the seasonings accordingly. If you do decide to buy some anchovies, they’ll last in your refrigerator for months. I just made this.. it was the best dressing ever, To the point where I was licking the blender! I used a mixture of cilantro, basil and parsley because they’re growing great this year, didn’t have chives or onion so I used about 2 tbs of finely minced cooking onion. I cannot get enough of this stuff!